Visit your local op shop. Op shops exist to provide cheap goods and support charities focused at helping the poor and ailing members of our community. They are generally staffed by volunteers and always have a bargain or two; or three. 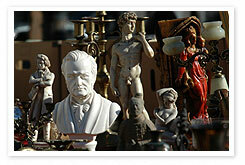 Check out local street markets and garage sales. These are another source of great deals and can also be an opportunity to meet your neighbours. The Garage Sale Trail site provides a growing list of garage sales across Australia. Look for signs on a light pole, in the community paper or on café notice boards to find out where and when. Buy second-hand goods online. Try reading The Choice Buying Guide: Second-Hand Goods, which describes the rights and responsibilities of buyers and sellers of second-hand goods. Reusing existing products has a two-fold effect on the environment. It reduces the need to extract more materials from nature and it circumvents large amount of concentrated (and often toxic) man-made materials entering the environment and having to be processed by nature. In 2006-2007, Australians generated approximately 43.8 million tonnes of solid waste, that’s over 2 tonnes per capita (Source:ABS). Approximately 48 per cent of this waste is buried in landfill. This represents a huge, ongoing loss of invested energy, extracted resources and natural services that could otherwise be recycled back into other man-made products and materials, or left in nature.